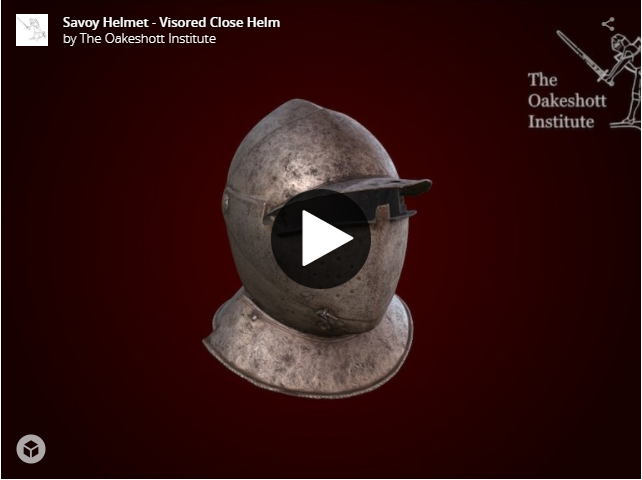 Here at The Oakeshott Institute, our mission is to promote scholarship and interest in ancient arms and armor. We are a 501(c)(3) non-profit organization, established by Christopher Poor in 2000. The Institute is named after the late Ewart Oakeshott, a leading authority on European arms and armor. Ewart and his wife Sybil Marshal spent a lifetime researching and collecting swords. The collection, now entrusted to The Oakeshott Institute, contains more than 75 pieces and spans nearly 4000 years of history. It was Ewart and Sybil's charge that the collection be a means to bring history alive to people today, not just as relics behind glass but as living objects from our past. Ewart firmly believed that to truly experience the sword one needed to touch it. He would say “a sword is a sad, lifeless object – but hold it in your hands and it comes to life!” A major goal in forming the Institute was to provide a space where both scholars and the public could share in the unique experience of interacting with historical pieces. As part of our mission to support all those with an interest in the past, we created the Historical Sword Documentation Project. This database creates an ever growing record for enthusiasts around the globe, allowing access to specifications of swords throughout the ages. The Oakeshott Institute’s Historical Sword Documentation Project advances to a new level with our three-dimensional modelling of the collection. This cutting edge advancement is the latest in The Oakeshott Institute's efforts to further realize Ewart and Sybil's dream. Allowing access to detailed images of the pieces and the ability to manipulate them in the round creates a new level of understanding for these objects for scholars at all levels. This will also allow us to produce unique content that will help raise funds to further this work allowing greater access for all. This Patreon campaign is an invitation to join our efforts as we build up this digital archive. While this is a project that is a personal passion for many of us, our ability to produce content right now is restricted to the equipment we have on hand and the free time available to us. Your contributions will go towards improving our tools and compensating our staff to continue this work in a regular manner. While the items depicted here currently are from our collection, as we expand our catalog of documented items you will see pieces from other private and public collections. The technology for these interactive displays is a great step forward for the research and study of these pieces and we look forward to partnering with others as we follow our mission to increase knowledge and understanding history as Ewart and Sybil tasked us to do. If you like the work we do and simply want to ensure it continues, this is the tier for you. Thank you for your support, and know that we at The Oakeshott Institute appreciate every contribution, big or small. The foundation of our effort, this tier is where the real work begins. You gain access to one additional model per month, to be released on the third Monday of the month. Your curiosity has driven you to take that extra step. As a reward, you now gain access to downloadable versions of a selection of the models. The history of the sword is an essential part of your life, and your patronage demonstrates it. This tier entitles you to all the above rewards. In addition, you will receive access to behind the scenes photos, sketches, and notes. You will also be able to vote on the next piece released. A true friend of The Oakeshott Institute, you are carrying our burden, and consider ours a worthy cause. You will receive all the above rewards as well as a limited run t-shirt once every six months from The Oakeshott Institute. An integral part of our effort, your contribution cannot be understated. In addition to the above rewards, you are entitled to a private guided tour of The Oakeshott Collection each year. A member of our most elite, you are invited to join us to discuss your favorite swords. Our conversation will be recorded and released as a podcast for the public. With this level of support, we will be able to dedicate serious resources to the archiving and modelling of the collection. Equipment will be upgraded, techniques will be refined, and people will be compensated for their hard effort and time. At $2500/mo, we will release an additional model to the public per month.